AMC, the American cable channel that's home to shows like Mad Men, Breaking Bad, and The Walking Dead, has more apps than you might think. 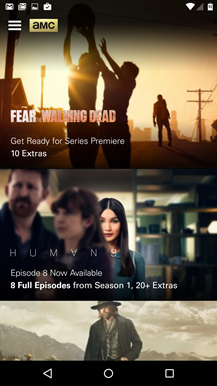 There's AMC Extras, a bunch of DVD-style content to promote various shows, AMC Tablet, which is basically a companion app for said shows, specialized apps for half a dozen other shows, and even a Christmas movie app. Now they've launched one that's just for watching new episodes... which makes sense, considering that's what most people want to do with their content in the first place. Episodes that are currently available to stream go in and out on a rolling basis, but the important ones (new episodes of currently-airing shows) appear a day or so after the episode has aired on cable television. 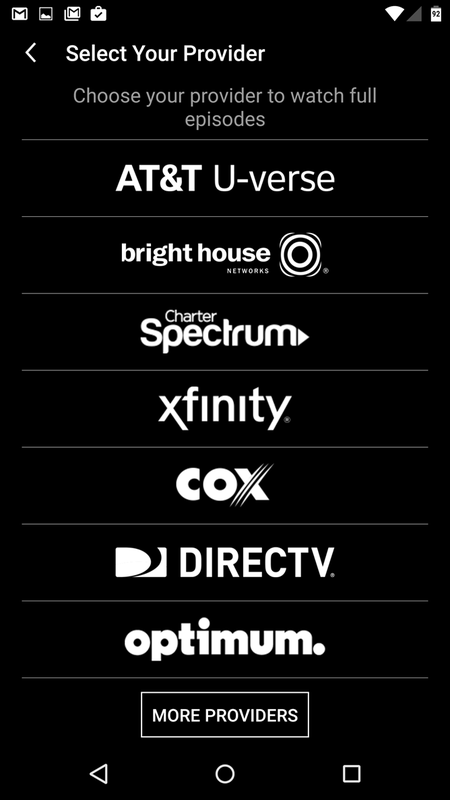 You'll have to log in to access the free stuff: at the moment the app supports cable subscribers from AT&T, BEK, Brighthouse, Charter Spectrum, Comcast/Xfinity, Cox, DirecTV, EPB, FTCtv, Hawaiian Telecom, LUS Fiber, Liberty Cablevision Puerto Rico, Midcontinent Communications, Optimum, Randolph Telephone, Swiftel, Time Warner Cable, Valunet, Verizon FiOS, and WOW. Not bad. Unfortunately the player interface itself leaves a lot to be desired. It doesn't properly hide the navigation buttons on my Nexus 6, and there's no option for streaming to a Chromecast. Even worse, the video seems to be slightly (and distractingly) out of sync with the audio. AMC does include commercial breaks, so that's nice. 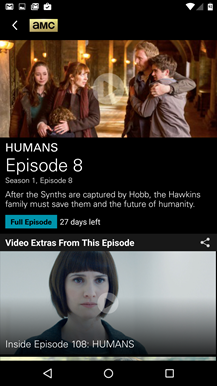 Most episodes include extras and behind-the-scenes footage, making the old AMC Extras app more or less unnecessary. The full backlog of shows isn't available, as is the case for HBO Go and other cable apps. 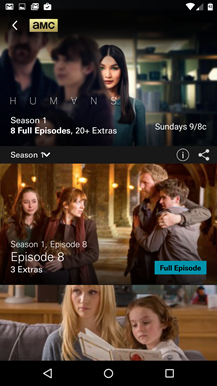 If you don't have a cable or satellite subscription, the app's episode listings include direct links to the Play Store where you can lay down some good old-fashioned dollars to buy them individually.